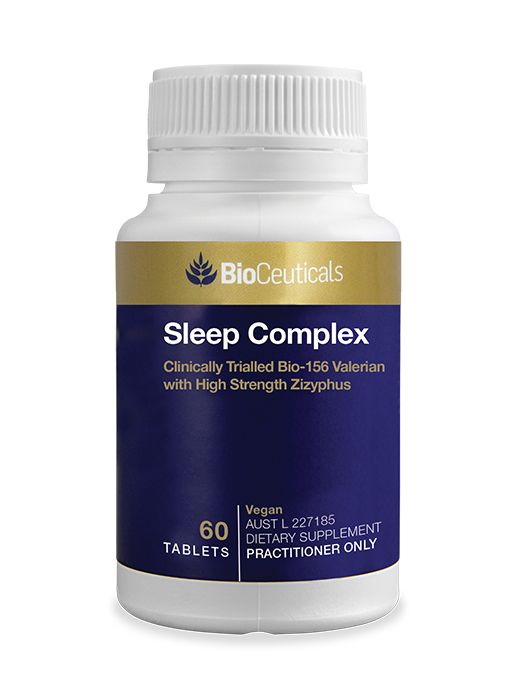 Clinically trialled Bio-156 valerian to help relieve sleeplessness with high strength zizyphus, lavender oil and sour cherry. 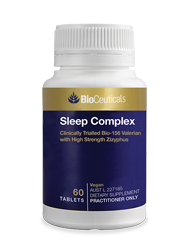 Sleep Complex combines the standardised valerian extract Bio-156 with the traditional Chinse medicine herb zizyphus and the traditional Western herbal medicine lavender oil, to help promote sleep. Bio-156 may support the quality of sleep and relieve sleeplessness, restlessness and mild nervous gastrointestinal complaints. Sleep Complex also includes sour cherry. In Australia, 13-33% of adults have regular difficulty in either getting to sleep or staying asleep. In NSW alone, almost one-fifth of the population are chronically sleep restricted. May help to promote sleep and provide relief from sleeplessness. Valerian is used traditionally in western herbal medicine to help relieve mild nervous tension and restlessness. Valerian is also used traditionally in western herbal medicine as a carminative for mild nervous gastrointestinal complaints. Contains the Bio-156 valerian extract, phyto-equivalent to the clinically trialled LI-156, which has been demonstrated to help promote the onset of deep sleep, improve sleep quality and enhance the feeling of being well rested after sleep. Zizyphus is traditionally used in traditional Chinese medicine (TCM) to relieve spontaneous sweating or night sweats. Adults: Take 2 tablets once daily, half to one hour before bed, or as directed by your healthcare practitioner. Contains 64mg of glucose per tablet.